Younger brother of Phyllis Neilson-Terry. Nephew of Dame Ellen Terry. Son of Julia Neilson and Fred Terry. Dennis was born into the legendary acting family and had big shoes to fill from day one. He made his stage debut in the 1906 jubilee celebrations for his aunt, Ellen, as a page in Much Ado About Nothing. Under the stage name “Derrick Dennis,” he made his next appearance as Silvius in As You Like It (1911). After this, he spent time with his parent’s company before touring with Sir Frank Benson‘s company, allowing him the opportunity to play many Shakespeare roles: Lorenzo in The Merchant of Venice, Rosencrantz in Hamlet, Paris in Romeo & Juliet, Octavius in Antony & Cleopatra, Demetrius in A Midsummer Night’s Dream, and Malcolm in Macbeth. 1912 proved to be another fruitful year for Dennis as it saw him performing with Sir Beerbohm Tree‘s company in a performance of Twelfth Night. He played Sebastian, twin to Viola, who was played by his own sister Phyllis. Therein, they seemed to replicate, for another generation, the brother-sister acting team of their father, Fred, and his sister, Ellen, in those exact roles. He also, that year, played Florizel in Harley Granville Barker‘s production of The Winter’s Tale. In 1913, he was especially praised for his starring role, a first for him, in Romeo & Juliet as Romeo. 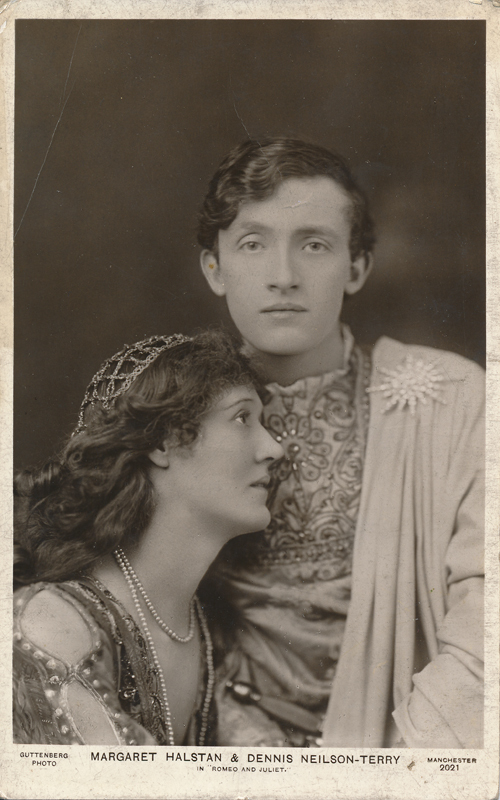 Before serving in the war, Dennis played Oberon in A Midsummer Night’s Dream (1914). Dennis served in the Royal West Surrey Regiment of the British Army, demobilized in 1917. He continued acting after the war, although he elected for comic and crowd-pleasing roles. He appeared in several films between 1916 and 1932. After a tour in 1932 with his wife in South Africa, Dennis contracted pneumonia at the age of thirty-six and died there. His body was taken back to England for a funeral and burial.